WESTFORD - Viateur A. 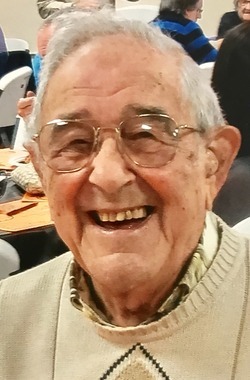 "Vic" Ricard, age 97, passed away on Tuesday, Feb. 20, 2018 at Life Care Center of Nashoba Valley in Littleton after a brief illness. For fifty-six years, he was the husband of the late Anita (Milot) Ricard who passed away in 1997. He was born in Westford on July 19, 1920, a son of the late Maxime and Rosa (Brule) Ricard. Vic was a lifelong resident of Westford and a communicant of St. Catherine of Alexandria Parish. He proudly served in the U.S. Army Air Corps during WWII. Prior to his retirement, Vic was employed as an electrician with Norman E. Day Inc. in Westford for forty years. He was a founding member and past president of the Franco American Club, member of the American Legion Post 159, member and Past Commander of the VFW Post 6539, and the Franco American Golf Club. Vic loved the game of golf, enjoyed bowling, playing cards, dancing, reading and was an avid fan of the Red Sox and Patriots. Above all, he enjoyed being with his family and friends. He is survived by his three children, Raymond Ricard and his companion, Janet Lawrence of Westford, Theresa Palma and her husband, Richard of Marlboro and Paul Ricard and his wife, Pamela of Westford; ten grandchildren, Michael, Lorraine, Steven, Angela, Richard, Jr., Paul, Robert, Tara, Daryl and Adam; fifteen great grandchildren; a sister-in-law, Rita Ricard of Chelmsford; also many nieces and nephews. Vic was predeceased by his siblings, Ida Finnila, Olivine Pierro, Claire Dozois, Theresa L'Heureux, Marie Deloge, Gerard, George, and Bernard Ricard and Bernadette McCarthy and was the companion for 18 years of the late Cecile Boisvert. ARRANGEMENTS - Family and friends will gather to honor and remember Vic at the J. A. HEALY SONS FUNERAL HOME, 57 N. Main St., WESTFORD, on Sunday, Feb. 25, from 3 to 6pm. His Funeral Mass will be celebrated on Monday morning at 9 o'clock at St. Catherine of Alexandria Church, 107 N. Main St., Westford (Friends are asked to please meet at church) Interment with Military Honors to follow at St. Catherine Cemetery. In lieu of flowers, memorial contributions may be made to the Westford Ambulance Fund, PO Box 197, Westford, MA 01886. To share your thoughts and memories of Vic, please visit click the sign guestbook link. Funeral Director, Scott Laurin.